The Baseline Positions Wizard is designed to help you enter and find baseline positions the first time you use TradeLog for an account. Click here for instructions about using the Baseline Positions Wizard. If you experience difficulties using the Baseline Positions Wizard and need technical support, please submit your support request directly from the software which will send our support team your TradeLog data file and the details entered in the wizard. This will allow us to provide the quickest support to help you finish using the wizard. Click here for instructions on submitting a support request from the software. 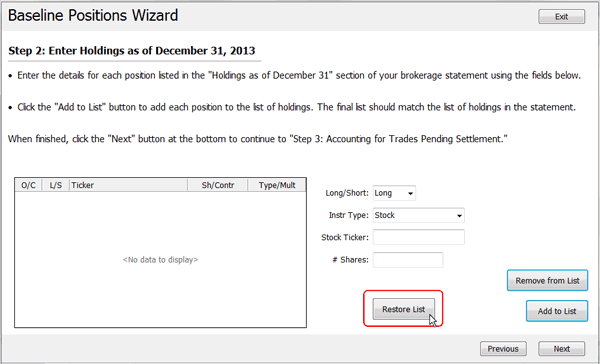 If you exited the Baseline Positions Wizard before completing, you can restart the wizard and often restore your list of holdings entered in Step 2. To restart the wizard, open your TradeLog data file and select the account tab you were working on. Click on the Add menu and select Baseline Position Wizard, or hit the F8 key on your keyboard. Click on the button to Begin Baseline Wizard. From Step 2 click the button to Restore List. 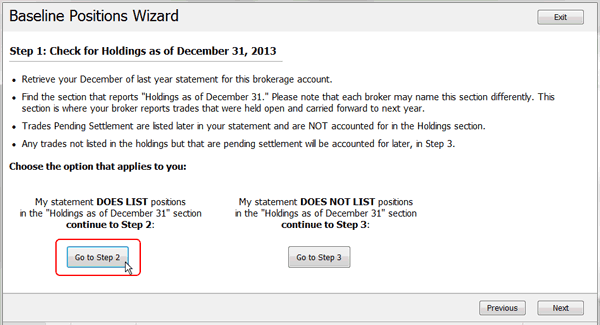 This will restore the list of holdings previously entered when you used the wizard. You can now add to or remove holdings from the list if needed and continue using the wizard to complete your baseline positions.